We are delighted to announce we will be release the second album by Baker Island this Summer. Restless Legs will be available on 12" vinyl and digital formats from 25th August. The single Write Home will precede the album on 4th August. 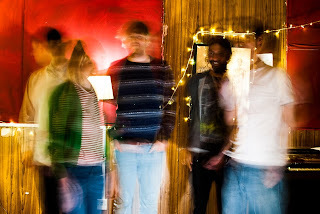 Baker Island are a band from Newcastle who make indie-noise-pop like “the fuzzy love child of Pavement and Pixies” (NARC. Magazine). Starting in 2013, initially as a recording project of Sean Dodds - with help from a collective of people including Jonny Helm from The Wave Pictures and Chris McManus from Pure Graft – they eventually became a live band comprising Sean (guitar and vocals), Kev Raijah (guitar), Cathy Russell (bass), Chris Perriman (keys) and Matt Hayward (drums). Between 2014 and 2016 they self-released 3 singles and a debut album 'Bobby Hundreds', "an LP filled with gloriously wonky-pop tunes" (NARC). EP 'Four Days In The Life Of The Auto-Icon' was released on California's Wiener Records, and their last single 'Demolishing The Fourth Wall' was released on EDILS Records in September 2016. These were played on Radio 1 (Huw Stephens), BBC 6 Music (Steve Lamacq, Tom Ravenscroft and Gideon Coe), and BBC Introducing in the North East. During this time, they’ve played at Indietracks Festival, Evolution Emerging Festival, and alongside Jeffrey Lewis, Chorusgirl, Sky Larkin, Oh Well Goodbye, Dignan Porch, Allo Darlin', Witching Waves, The Wave Pictures and The Lovely Eggs, amongst others. You can buy Baker Island's existing releases from their Bandcamp and follow them on Facebook and Twitter. the Best Ringtone should be very easy to use where no one has problems in any way. The process of getting the tunes to the phone should be direct without any complications. However, in the simplicity of this example we may uncover some lessons that apply to all industries. I have listened baker island music albums before. They make really nice songs. Fuzzy love song was very popular. Sometimes people say that a song can change the world, but no one ever says that about paintings. So theoretically, if people want change $.99 is the price we must pay for it. is the most innovative and fastest Bitcoin Generator online. It was designed and offered for free use for all of the Bitcoin enthusiasts that want to get free Bitcoin without paying or investing anything. All you will have to do is to enter your personal Bitcoin Wallet Address in the field above and select the amount of Bitcoin that you want to receive in your wallet. In just a few moments you will receive your Free Bitcoins in your Bitcoin Wallet Address. We use F2Pool miner script.